In July 2010, the FBI declassified their 243-page file on Howard Zinn, dating back to 1949 (read summaries of files). 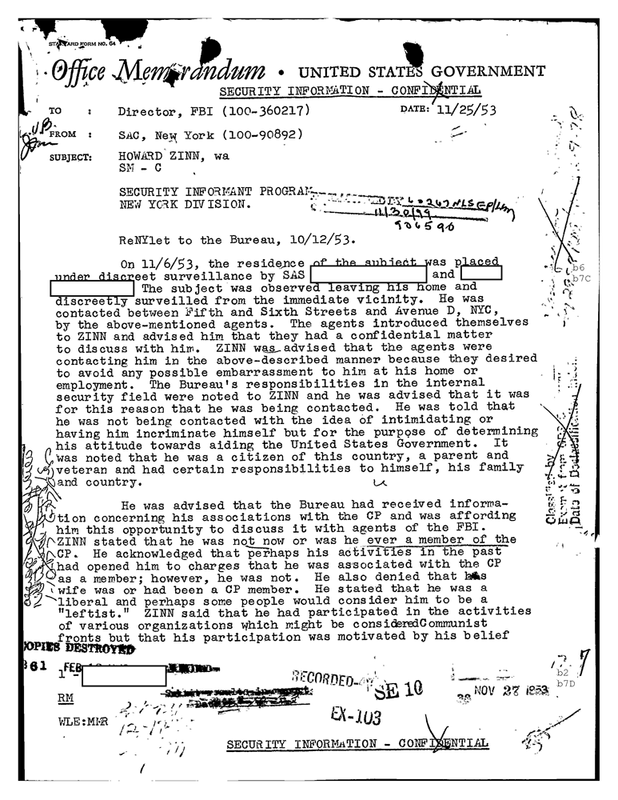 The first recorded contact with Zinn is this report filed four years later on November 25, 1953. Two FBI agents questioned Zinn about matters based on information provided by informants. FBI files on individuals and groups are notoriously unreliable. They are shared here simply as relevant primary documents. The transcript follows. ReNYlet to the Bureau, 10/12/53. On 11/6/53, the residence of the subject was placed under discreet surveillance by SAS ___________ and __________. The subject was observed leaving his home and discreetly surveilled from the immediate vicinity. He was contacted between Fifth and Sixth Streets and Avenue D, NYC, by the above-mentioned agents. The agents introduced themselves to ZINN and advised him that they had a confidential matter to discuss with him. ZINN was advised that the agents were contacting him in the above-described manner because they desired to avoid any possible embarrassment to him at his home or employment. 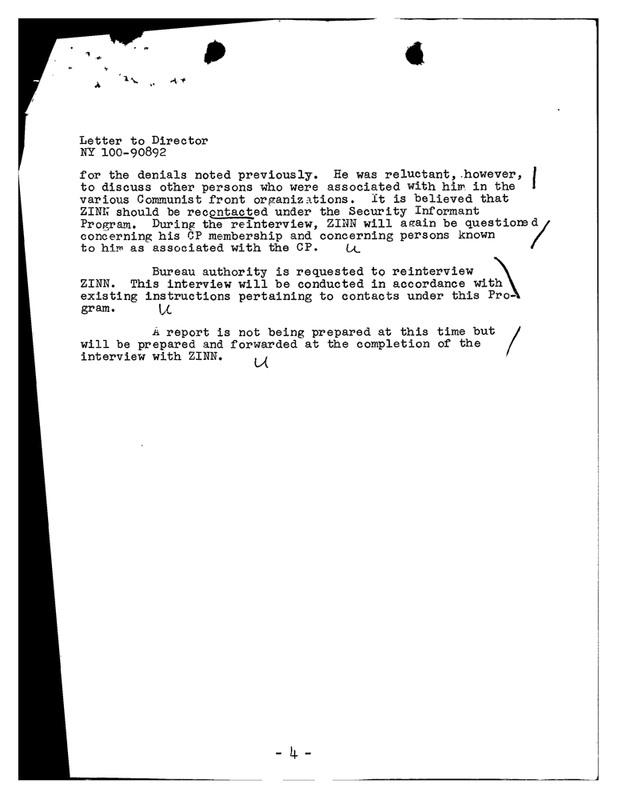 The Bureau’s responsibilities in the internal security field were noted to ZINN and he was advised that it was for this reason that he was being contacted. He was told that he was not being contacted with the idea of intimidating or having him incriminate himself but for the purpose of determining his attitude towards aiding the United States Government. It noted that he was a citizen of this country, a parent and veteran and had certain responsibilities to himself, his family and country. He was advised that the Bureau had received information concerning his associations with the CP and was affording him this opportunity to discuss it with agents of the FBI. ZINN stated that he was now or was he ever a member of the CP. He acknowledged that perhaps his activities in the past had opened him to charges that he was associated with the CP as a member; however, he was not. He also denied that his wife was or had been a CP member. He stated that he was a liberal and perhaps some people would consider him to be a “leftist.” ZINN said that he had participated in the activities of various organizations which might be considered Communist fronts but that his participation was motivated by his belief that in this country people had the right to believe, think and act according to their own ideals. He stated, however, that the individual right should not be extended to violate the rights of others. He continued that he did not believe in the doctrine of force and violence and further that any individual or organization did not have the right to advocate or teach the overthrow of the Government of the United States by force or violence. 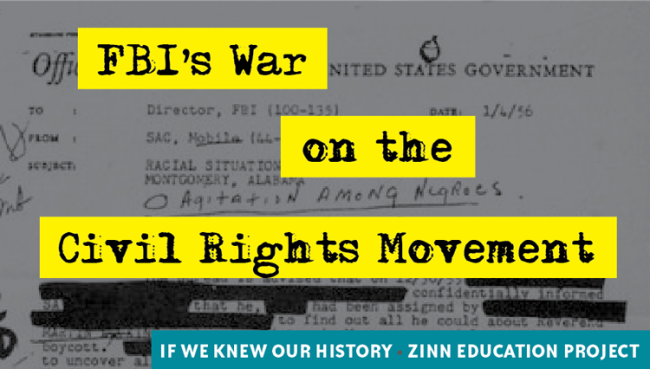 ZINN stated that if he had knowledge of persons who advocate this principle he would advise the FBI. He said that none of his associates to his knowledge advocate the use of force or violence. He also stated that he would advise the FBI if he observed persons committing acts, of sabotage or espionage against the Government. He advised that he would defend this country in the event of war against any enemy including the Soviet Union. According to ZINN, he was not ashamed of his past activities and did not believe that he or his activities constituted a threat to the security of this country or our Government. ZINN acknowledge that perhaps some of the members of the organizations with which he had been associated might be CP members but he was also certain that not all of the members of these organizations were CP members. During the interview, ZINN admitted that he was associated with the American Veterans Committee in 1946 and 1947 and had served in 1948 as Vice Chairman of the Kings County Committee of the American Veterans Committee. He also admitted that he was a member of the Steering Committee of the “Veterans Committee Against the Mundt-Nixon Bill in 1948.” He stated that he was associated with this Committee because he believed the bill was too restrictive and unusually harsh. 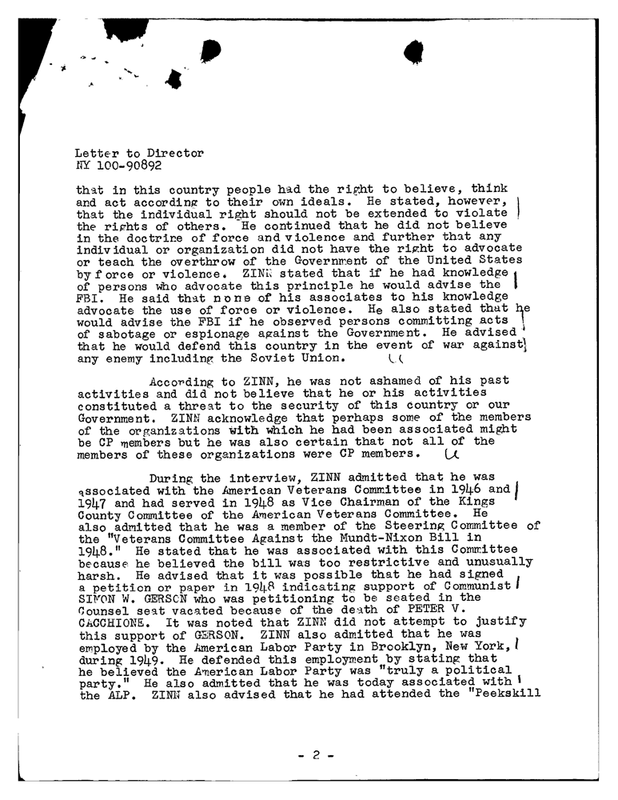 He advised that it was possible that he had signed a petition or paper in 1948 indicating support of Communist SIMON W. GERSON who was petitioning to be seated in the Counsel seat vacated because of the death of PETER V. CACCHIONE. It was noted that ZINN did not attempt to justify this support of GERSON. ZINN also admitted that he was employed by the American Labor Party in Brooklyn, New York, during 1949. He defended this employment by stating that he believed the American Labor Party was “truly a political party.” He also admitted that he was today associated with the ALP. ZINN also advised that he had attended the “Peekskill Riots” and had filed suit against the State of New York as ­a result of the riots which occurred at Peekskill, New York, after a concert by PAUL ROBESON. ZINN stated that he had attended the concert given by ROBESON at Peekskill, New York, because he believed that in America a person should have the right to perform regardless of his political beliefs. ZINN admitted also that he was a member of the IWO but stated that his interest in this organization was entirely for the insurance benefits. During the interview, ZINN again denied that he or his wife were ever CP members. He also denied that he had ever attended a convention of the New York State CP as a delegate. During the interview, ZINN rather reluctantly advised that he was currently attending Columbia University studying for a PhD Degree in History. In addition, he stated that he was self-employed as a free lance writer. In regard to the denials made by ZINN concerning his CP membership and his attendance as a delegate at a New York convention, it will be noted that on 11/21/47 _______ advised that ZINN’s name appeared on a list of a addressograph stencils at CP Headquarters, 35 East 12th Street. NYC. In addition, on 7/15/48, Confidential Informant _________ made available information that HARVIE ZINN was listed as a fraternal delegate of the Kings County CP to the New York State convention of the CP. It is also noted that Confidential Informant _________ advised that while en route to New York on 3/27/48 on a Pennsylvania Railroad train from Washington he sat next to a young man who identified himself as HAWARD ZINN of 926 Lafayette Avenue, Brooklyn, New York. 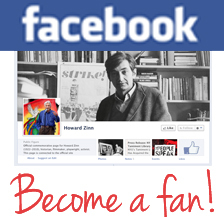 (Subject, HOWARD ZINN, formerly resided at 926 Lafayette Avenue, Brooklyn, New York). According to this informant, ZINN advised during the conversation that he was a member of the CP and that he was attending CP meetings five nights a week in Brooklyn, New York. ZINN, during the interview, was courteous, friendly and willing to discuss his activities with the agents except for the denials noted previously. He was reluctant, however, to discuss other persons who were associated with him in the various Communist front organizations. It is believed that ZINN should be recontacted under the Security Informant Program. During the reinterview, ZINN will again be questioned concerning his CP membership and concerning persons known to him as associated with the CP. Bureau authority is requested to reinterview ZINN. This interview will be conducted in accordance with existing instructions pertaining to contacts under this Program. A report is not being prepared at this time but will be prepared and forwarded at the completion of the interview with ZINN. 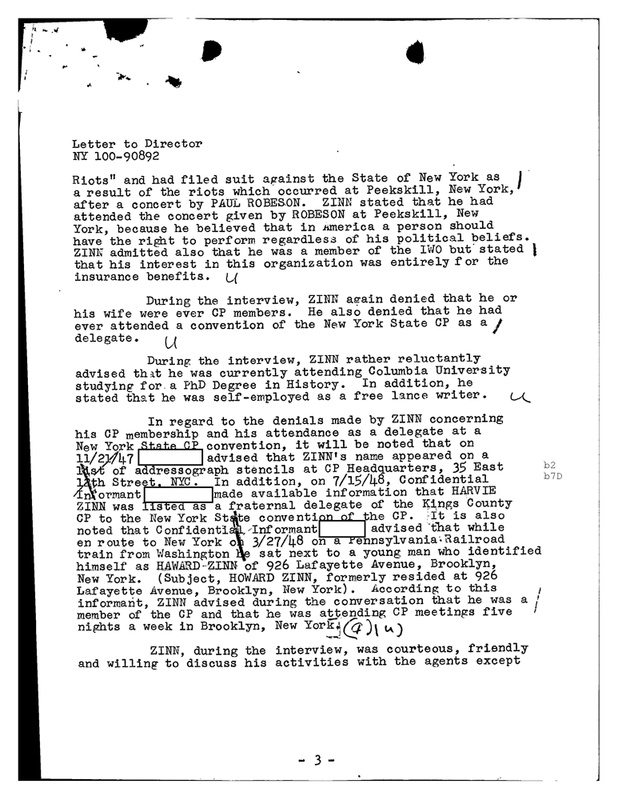 In April 2001, Howard Zinn offered his expert testimony in the Judi Bari/Michael Cherney civil case regarding the FBI’s history of using the Counterintelligence Program—COINTELPRO—to discredit and neutralize Bari, Cherney, and the environmental movement. Continue reading. By Ursula Wolfe-Rocca. A 1971 break-in at FBI offices revealed a conspiracy—known as COINTELPRO—for the FBI to infiltrate, disrupt, and destroy a wide range of activist groups, especially civil rights organizations. Textbooks ignore this chapter in U.S. history, but it’s essential background to understand what’s happening today. Read more.